I have the same goal I've had ever since I was a girl. I want to rule the world. Patry Francis is a writer I stumbled upon one day via her blog. It used to be titled I'm Not Really a Waitress. The name resonated with me. "Hey, I'm not really a waitress, either!" I thought. "I'm really a writer, no matter how unbelievable that sounds to the customers I wait on." 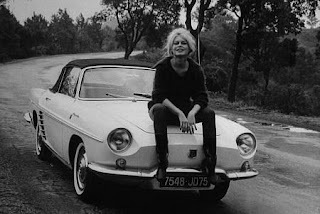 I felt there must be something Patry and I 'got' about each other, both struggling to make it as writers-by-day, waitresses-by-night. I linked my blog to hers immediately. In the months that followed I learned Patry was definitely more writer than waitress: the hardcover version of her first novel had been signed by a publishing house. The manuscript was delivered, edited, and presumably already in production by the time I found her blog. Six months later the book was published. Sometime during that process, Ms. Francis hung up her apron permanently. I loved it, and was very happy for this fellow writer/stranger: she was living out a life-long dream and posting about it frequently. It's a dream I share, so I looked on. Patry got quiet after the book came out because she was busy promoting it . She went on a book tour and traveled across the country for readings and signings! Publishers never plan book tours anymore, so I knew this must mean her book was well-received. Patry stayed quiet over the summer, but a few posts indicated that she was busy digging deep into the writing of her second novel! More of the same dream come true. I checked her blog less and less frequently but thought of this writer/stranger fondly. It made me smile to think of the kind comments she left for me, encouraging me not to give up on my book as my initial attempts to get an agent were rebuffed. This November I stopped by SIMPLY WAIT to see what was up with this quietly inspirational fellow writer I'd "met" through the computer. "Haven't been by in a while," I thought. "Wonder where book 2 is at?" I was directed immediately to this post and discovered my blog friend had been diagnosed with cancer. And her last four or five posts were about the cancer. The finding out part. The facing it part. The hospital for surgery part. The coming home part. The back to the hospital part. I felt strangely guilty for not checking in on her. And imminently vulnerable that something so serious happened while I wasn't looking. And a little odd because the news made me feel so upset, it made me cry. Is it weird to cry about someone you've never met, who you don't know beyond an Internet window into their world? I immediately posted a heartfelt comment on Patry's blog. Yesterday I read in Publisher's Lunch that the paperback edition of Patry's first novel The Liar's Diary pubs today, and that "a large coalition of authors, agents, publishing professionals, journalists and bloggers has formed to publicize the release following Francis's recent diagnosis of an aggressive form of cancer." The list includes people like Khaled Hosseini, Marcus Sakey, Douglas Preston, Lorenzo Carcaterra, Caroline Leavitt, Jacquelyn Mitchard, MJ Rose and Jennifer Weiner. No one invited me to join, but I decided to play too, in honor of this virtual stranger, the quiet inspiration she's given me, and her very human struggle with a very scary disease. Thanks, Patry, for letting me look on. Here's the Amazon link to her book. I ordered my copy today. See it? Right there in the front? Usually Jason does a toner rinse for me, but last Wednesday, he decided to bring the whole of my head up a notch. "How blonde do you want to be, Kitty?" he asked. "What do you think?" I said. The guantlet was thrown. 10 minutes later, Jason was rushing me from the chair to the shampoo bowl: "It's turning grey, Kitty, go! Over to the shampoo bowl! NOW!" I threw the January issue of Shape on the floor and ran. It could rest there in a pile of hair for now. Who really cares what my "happy weight" is, anyway? The moral of the story: ladies, beware. 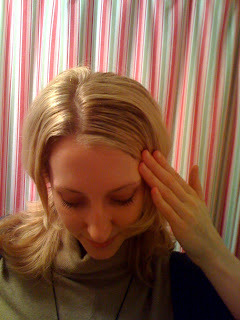 Blonde hair = bleach + hues of purple & blue to off-set brassiness & orange. In short, when you really go for it with peroxide, grey is just minutes away. This evening at Toro I had the pleasure of waiting on fellow waitress Sarah's favorite regulars. As I approached the table to pour their sparkling water, Sarah introduced me. "Kitty, this is Dave and this is Jan," she said. "They come in here all the time," Sarah told me, "Don't you guys? You haven't met Kitty before, have you?" She asked the regulars. They shook their heads and smiled up at us. "But I guess it's not usually on a night when you work." "No surprise there," I said, "I only work one night a week at the moment. Well, I used to work more than that. Actually, my schedule has changed a lot since I started here: first I worked Sundays, Wednesdays, and Fridays, then Sundays, Wednesdays, and Thursdays, now I just work Sundays. Surprising that we never met. But how lovely it is to meet you now!" The couple smiled and shrugged. They looked so familiar to me...yet to them, my face didn't ring a bell. Only several hours later, as Dave & Jan were finishing up their meal, did I realize: I did meet Dave & Jan before. Almost a year ago, actually, on the same night of the week (Sunday) in the same section of the restaurant (by the fireplace.) Sarah chatted them up the whole time they were at Toro, just like tonight, and introduced me to them as her favorite regulars. There was just one major difference between that night and this night back then, my hair was dark brown. Now I am blonde. It's a little absurd how frequently this happens to me. Entire relationships, begun and forgotten because of a simple change to the shade of my hair. But then again, I guess that's why we're here, isn't it? It kinda makes me look like Miss America...even though I'm just standing in the living room. In 2008 platinum blondes are all but common. But it hasn't always been this way. 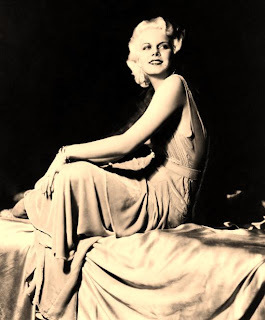 While women have been dying their hair blonde for millennia, starting with the Ancient Greeks, followed by the Ancient Romans, and pretty much every known civilization that followed, the "platinum blonde" didn't develop until early this century, when a young screen actress named Jean Harlow broke into the movie business. With Jean Harlow the stars aligned perfectly: not only was peroxide safer and more accessible to modern women of the 1930s than for previous generations (though not nearly as accessible as became in the 1950s thanks to Clairol), innovations in lighting and new types of film stock made blonde hair appear lighter than ever before. The talkies were just catching on. 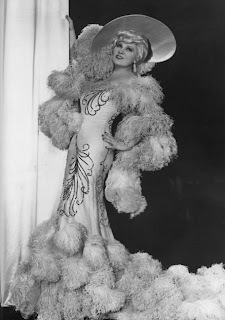 Harlow had recently moved to Hollywood where she sort of fell into the movie business...or was pushed into it by her over-bearing stage mother (the real Jean Harlow; the famous young actress' birth name was Harlean Capenter.) A recent divorce left Harlow nee Harlean broke, and necessitated that she work as much as possible to make ends meet. 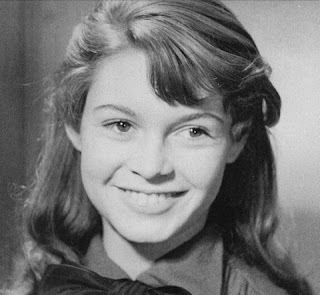 As a result, young Jean appeared in three films that opened at the same time in 1931. 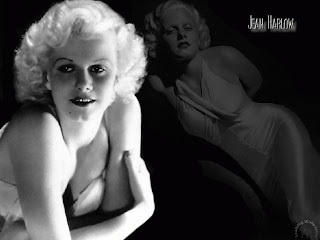 Suddenly Jean Harlow was everywhere and her "look" became a sensation. 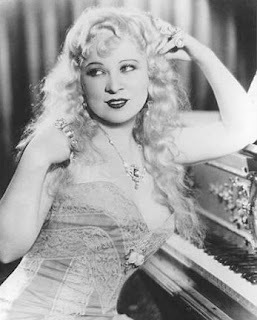 "Flaxen, tow, yellow, gold -- none of these was dazzling enough, modern enough -- to describe the astonishing hair of the movie stars of the late 1920s and early '30s," writes Ellen Tremper in I'm No Angel: The Blonde in Fiction and Film. "It was called platinum, after the jeweler's metal, rarer, even more valuable than gold." Platinum blonde. 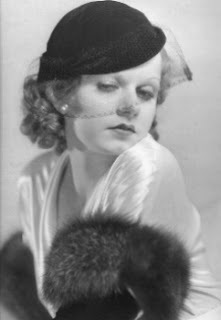 In 1931, Jean Harlow starred in a film of the same name, based on a young starlet whose life was not unlike her own. 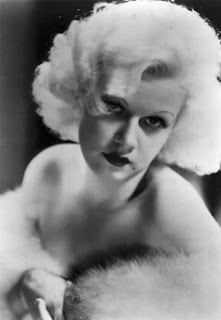 So today, we celebrate Jean Harlow who gave bleach blondes of the 20th century new heights of blondeness to which to aspire. The girls just left, all full & boozy and I am busy cleaning. While I attend to the needs of my humbly rocked abode, here's a delicious nightcap cocktail to put your weary mind to sleep. Do try this at home -- it's worth the extra calories. My thoughts after drinking this? Why don't I drink cream every day? Pairs nicely with home-made blondies. 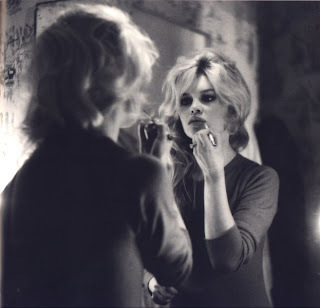 You'll be in blonde heaven. It's not sweet really, so much as full in the mouth & rich and creamy the palate. The spicy cayenne is a delight with the hot booziness of the brandy. Full, rich, and spicy: just like the old broad herself. I approach table 48, cocotte of beef short ribs in hand. "Here you folks go," I say, "the short ribs. Be careful, the plate's hot." The man with his back to me swivels in his chair, looks up. "Beef short ribs..." I start to explain. Sometimes people forget what they order, and I'm more than happy to explain when they do. "I mean, Jesus," he says. "Boy, are you ugly." He takes a sip of cava. "AND you have bad skin..."
Could this be a table of fabulously catty, boozy gay men, here to brighten up my night? "I mean, are you really that pretty? I bet you've got a great boyfriend, too," he spits out the words, coy smile buried beneath feigned cruelty. His guests look on, a mixture of drunk, and embarrassed, and in full agreement. "And you're in a totally great relationship. Do you have a great boyfriend, sweetheart? Are you in a great relationship??" "Mm-hmm," I nod, shrugging my shoulders, like the luckiest girl in the Brady family. "And he's rich, too." I smile. "And look, there's the smile. Just look at that smile. You've gotta be kidding me." "Yeah," I say, "totally rich." I shrug again, as the fact that only good things ever happen to me is one of life's great puzzles. "I know," I say. "I try." MLK Day celebraters, how did you spend your special Sunday? So, I pouted about the smoke alarm all day yesterday. I called up my landlord and made a fuss. And when the Mathematician finally got home last night at 7 p.m., I made him get immediately up on the chair to "deal with that freaking thing." I watched from below, and barked suggestions up to him as he pulled the alarm out of the ceiling, ripped out the battery, and pushed every last button on its exterior white casing in an attempt to get it to stop beeping. Miraculously, it the smoke alarm chirped on. So, we left. 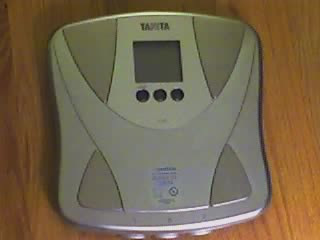 We went to dinner, the to the movies, and while we were out, we picked up a replacement battery for the smoke alarm. We could still hear it chirping from the foyer of my building when we got home at 11:30--and we live on the fourth floor. And the minute we crossed the threshold into our apartment I forced the Mathematician back up onto the chair. "Fix it!" I cried. "I've been hearing that goddamn thing chirp every five seconds since noon today! Fix it, goddamn it, fix it!" I stomped down the hall to the bathroom, hands over my ears. Earlier that the afternoon I felt annoyed at the smoke alarm, for how helpless it rendered me, being so high up on the ceiling and so broken. I hate feeling like a damsel in distress, I thought, waiting for my boyfriend or my paternalistic landlord to come home and fix my problems. My Sarah Lawrence friends would be ashamed. Post movie, however, these feminist thoughts were long gone. By 11:30 p.m., I felt like the kind of stark-raving mad female main character you might find in a Bronte novel. Thank god the Mathematician was there, to save me -- and the building-- from myself. The Mathematician climbed up on the chair in his dutiful way, and commenced tinkering with the smoke alarm. He installed the new battery. The alarm chirped on. "I don't think that sound isn't coming from this. It's coming from somewhere else...in there." He pointed to the guest bedroom. Seconds later the Mathematician held the real culprit in hand -- a carbon monoxide monitor with a dying battery. Guess where he found it? Plugged into an outlet behind the guest bed, about a foot about the ground. Well within my reach. I believe that qualifies as the blonde moment of the week. I decided recently that Marilyn Monroe is one of my all-time favorite blondes. I know, I know. It seems like a no-brainer. 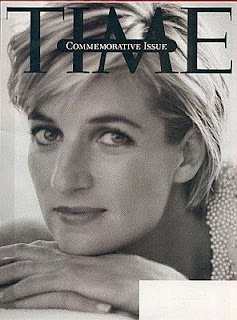 She scored the #9 spot on Forbes' Top Earning Dead Celebrities List in 2007, after all--anyone that lucrative clearly strikes the fancy of many. (She's the only woman on there, too.) But the more I learn about Marilyn, her tragic childhood, her difficult life in the spotlight, and her sad death by her own hand, the more I feel fascinated by her. In light of this fascination, I decided, on a whim, to purchase these coasters with her image on them from Posh on Tremont Street a few weeks ago. The Mathematician and I were killing time waiting for a table at Aquitaine one Sunday, so we wandered in to look around. Posh is one of those stores that sells expensive nothing: novelties, silly cards, board games with names like "Dog-opoly". "Oooh, they have coasters with Marilyn on them!!!" I exclaimed when I saw the display. "Let's get them!" I guess you could say I got caught up in the moment. $40 and 20 minutes later, there I was eating brunch at Aquitaine, happy as a clam with two boxes full of Marilyn Monroe coasters be my side. The thing is, part of the reason I bought the coasters because we needed them. I grew up in a coaster house, and have since been trained to use one under all beverages glasses (except those with stems, like wine or martini glasses.) 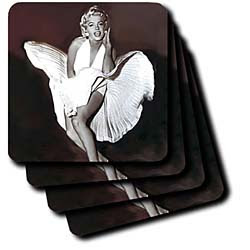 And since I bought them, I've used my Marilyn coasters every day. But last night, while getting up to grab something from the kitchen, I put my glass down on Marilyn's face and it made me feel sad: there was Marilyn's enigmatic smile staring up at me. And there was my pint glass full of l'eau, on top of it. Water swished back and forth in the bottom of the clear glass as the liquid settled; her face swayed back and forth, too, suspended and submarine. It made me feel sad to commodify Marilyn so because I believe her status as a living, breathing commodity is what drove her nuts. Feeling less a person than a thing, contrived and controlled by other people all the time--it must have been terrible. And I think it's a feeling to which many women can relate. Or at least, I can. I love those coasters, but now they kind of make me sad. So, where am I going to put my drinks? According to an email I received this evening from Marina Scuola in Italy, my Email Address attached to a Ticket Number has one me 1,000,000.00 Euros! Because our dollar blows right now, that's actually 1,487,698.00 bills in America!!! I wonder if Marina in Italy knows that Mrs Barbera De Graft in the Netherlands also contacted me today to let me know that I won the Euromillion. In fact, according to Barbera De Graft, I have won the Euromillion every third day for the last six months. What is that, like 60 million Euros, or $89, 261, 937 American? Wow, I must be one of the richest blondes in Europe! Enough with this Blog 365 nonsense! I must respond urgently to claim my prize! Here's a cocktail recipe to get you all through the weekend. I will be serving it when LUPEC finally reconvenes to celebrate blondes at my house in a week and a half. I can't wait! I always love to compare, don't you? We women look so different after hair and make-up, don't we? Book hair appointment, Jason abolishes my roots. I walk out of salon feeling beautiful, rejuvenated, revived. People comment on how pretty I look. Traffic stops, I feel movie-star glam. A few days later I wash my hair (I only need to do this twice a week since my hair is so dry & my skin is the opposite of oily), blow dry it myself for the first time. 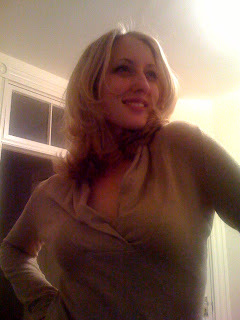 Doesn't ever look quite as good as it did when Jason did it, but still falls into place beautifully--and bright blonde. About a week later: Hair doesn't look quite as wonderful as it did right when I left the salon, but still lookin' good. Can see the first hint of roots...oh no you can't...oh yes you can...who cares? Jason is so good, they look natural when they grow in. 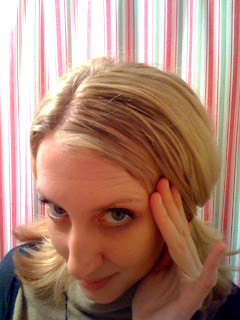 About three weeks after first appointment: blonde highlights start to look more yellow. Hair starts to seem less healthy, drier, no matter how much I condition . Four weeks later: I wake up one day and discover that suddenly overnight my roots have become noticeable. My hair looks kinda dirty, despite the fact that I just washed it yesterday. I feel depressed. *sigh* It certainly is an addictive habit. I got to thinking about the term "blonde moment" today. It's become 100% synonymous with flakiness, ditziness, and stupid, innocent mistakes. But when did we, as a culture, start using it to describe a state of mind and excuse our errors? I started to do a little research...then got sidetracked by the plethora of jokes & videos out there that so glorious illustrate the concept. Like this one, from the '70s, with love. I woke up yesterday, New Year's Eve, feeling terribly depressed. But mostly I felt deeply discouraged that, after almost ten years in the service industry, I am still totally married to it. My writing and public relations careers have progressed, to be sure: I been promoted one and a half times in my PR job, have acquired a literary agent for my writing career, and am reaching a modicum of professional success that any other 28-year-old would likely find extremely satisfying. Yet still, after all of this time, it is the waitressing money I depend upon to make ends meet each month. It's not Toro's fault. I love everything about working at Toro: the people I work with, the delicious food, the easy money. That job is a waitress's dream. It's not even the restaurant industry's fault. Ultimately, having to work two jobs, well, that's what I get for choosing an artistic, half-dead industry for my career. Theoretically, I don't regret that choice for a second. When it comes to working holidays, however, I have to wonder: would a career in a boring-yet-lucrative industry have been so bad? All day long, I pouted about having to work on New Year's Eve. I lingered about the house as late as I could that afternoon, curling my hair to cover up my mood with a "festive" 'do, watching snippets of the Law & Order: Criminal Intent marathon, fussing endlessly with my eye make-up. I didn't leave for work until the last possible minute--so late I had to take a cab to Toro to make it there by 4 p.m. A cold gust of wind whipped my freshly curled New Year's Eve locks into my face, rendering me blind as the taxi pulled up to the curb to collect me. "1704 Washington Street," I told the cab driver, then sank into the backseat to resume pouting. "So, are you ready for the New Year?" the cabbie asked in proper, accented English. "No, I'm really not," I replied. "I'm heading to work at my waitress job now, and I'm not really sure what to expect. New Year's Eve is always kinda crazy." "Yes, yes, this is true," the cabbie laughed. "Lots of people out and about. But I bet the money is good, yes?" "Yeah, I guess. I've just been working New Year's Eve for so many years now. I hardly think it's worth it any more. So many people, so much pressure, and it's so stressful." "Yes," the cab-driver chimed in, "it's difficult. So busy and people are so crazy!" "Yeah! And in my experience, you usually end up over-staffed and not really making much more money than you would on a busy Saturday. I'm just over it, I guess. I hate working holidays." Neither of us said anything for a moment. I descended another step in my path to self-pity. "I know," the cab driver said, his voice heavy. "I came to this country five years ago. Originally I am from Brazil. And the very first time I worked New Year's Eve here, I cried." "Yes, yes, it's true. I pulled right over to the side of the road and just cried. Because in Brazil, I never worked on New Year's Eve. Never! I always spent the night with my family, my friends, celebrating. But when I came here, the New Year just didn't feel much of a holiday. So I worked. No family here, not many friends. Might as well work." "Yeah," I said, my voice soft in my throat. "Might as well work." I tried to imagine what it would be like to drive a taxi back and forth across the city all night, in a cold, snowy foreign country, without a single friend or family member to see on New Year's Eve. People are so rude to taxi drivers, way ruder than they are to waitresses, and especially when they're drunk, which people always are on New Year's Eve. Suddenly I was jarred out of feeling bad for myself, and directly into feeling bad for this poor Brazilian cab driver. "Anyway, that's life, you know?" the cab driver said. "Everybody has to work. You have to make money, and to make money, you have to work." "It's true," I said. "That's life." A moment later, there we were, at Toro. "Thanks so much," I said, "And thanks for chatting with me. I wish you the best and I hope you have a Happy New Year." "Thank you!" he said. "Good luck tonight! And I hope you have a Happy New Year, too!" "I will," I said, thinking of the awesome friends I work with, awaiting me inside, my wonderful boyfriend, awaiting me at home, my beautiful, comfortable, truly home-y Boston home. "I definitely will."